Chances are, if you find yourself in San Francisco, you’ll end up in Union Square at some point. Union Square is the retail and cultural hub of San Francisco, boosting the city’s largest collection of luxury, department and boutique shopping. So many businesses packed into a small area can be confusing to first-time and longtime visitors. Some clarity and guidance was called for. 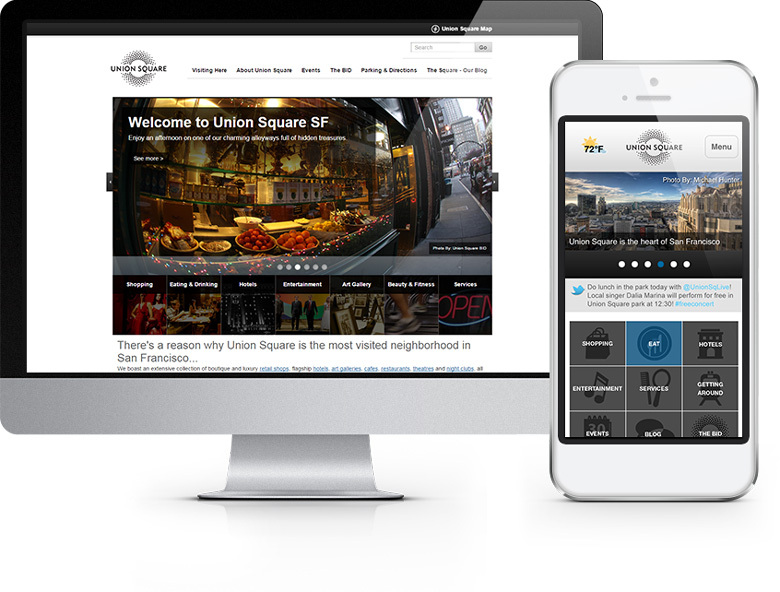 We developed Union Square’s new site to enhance user experience and better track site performance. Before the site was built, Union Square was unable to project or analyze its measurable goals. The Square wanted to measure website traffic, visitor flow, the impact of social media and other key performance indicators. The site also needed to be optimized for mobile users. Now mobile users can find a business in Union Square based on what’s nearby. Since March 2013, Union Square has doubled its paid search traffic while maintaining a flat budget. By focusing on quality score, relevant content and the user experience, the average cost-per-click is now under $0.35 and the conversion rates are consistently in the double digits. Noble Studios also leveraged lessons from the paid search campaign to create a robust SEO program to provide a cost effective lift in both traffic and conversions. Through an integrated strategy, our efforts helped boost organic search traffic by 111 percent over previous year. We achieved this by identifying gaps and opportunities in their content as it related to user search demand.